This good-looking storage sack impressed me immediately with its very useful size and clever closing design. The sack was offered to me to evaluate and no attempt was made to secure a positive review, or indeed any review at all. However, I am happy to share my experience and observations because I think this sort of quality accessory can be useful in a wide range of situations. 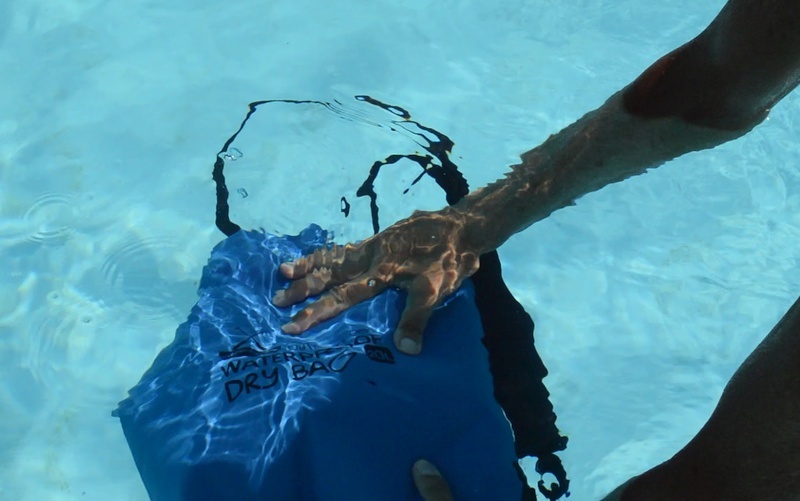 The obvious ones are camping, outdoor activities, boating and travel, but I have now adopted this sack as my swimming pool bag and my husband often borrows it to take to the gym and the weight room, as it will keep wet things inside it from leaking out and staining the car seat. It is also very useful to protect photographic equipment from the rain, provided you carry each camera inside its own storage bag. The sack is designed very simply as a carry-all without any internal compartments or external pockets. This is intentional as stitching compromises the waterproof capabilities of any item. 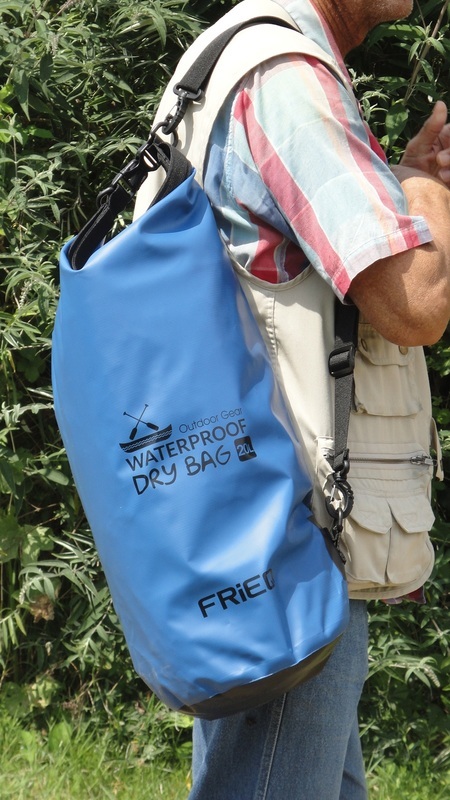 The only stitching here is the top reinforced border (which disappears inside three layers of waterproof material when the sack is closed) and the section at the bottom where the carrying strap is attached. A same-material patch is firmly glued in place where stitching is unavoidable. 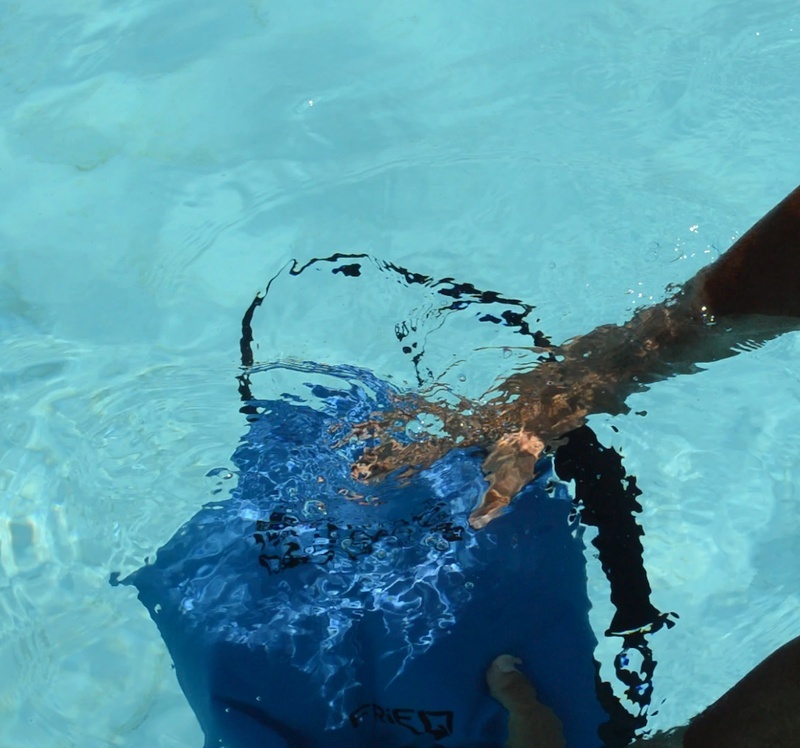 The sack is available in black, a beautiful powder blue and a high-visibility yellow, and in two sizes, 10 litres and 20 litres. I opted for the blue 20 litre, in consideration of the fact that, when properly closed (by folding the top edge over three times and locking the clasp) interior capacity is necessarily reduced. The flat outer dimensions are 15” wide x 23” long, or 38 cm x 58 cm (once closed, that removes about 6” or 15 cm from the usable space). The sack can be carried slung over one shoulder or across your chest by means of a very tough-looking strap of synthetic webbing. Given the nature of the top closure, I would not expect total water-tightness in extreme conditions such as when the sack is immersed in water or dragged through moving water. 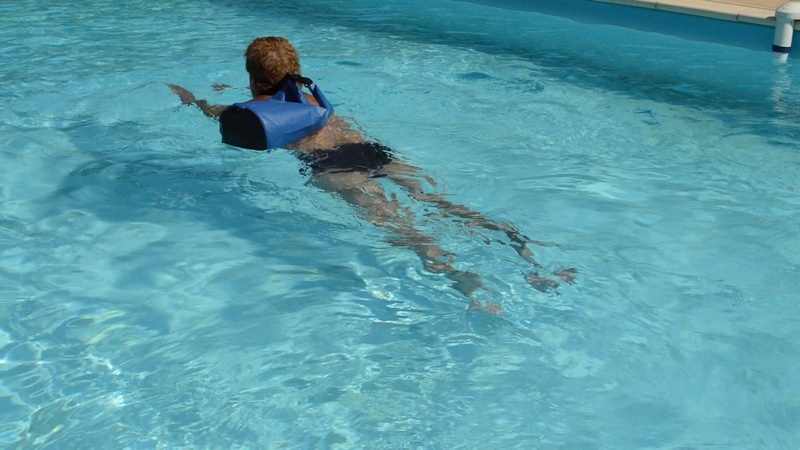 The product description states clearly that additional protection is recommended for cameras and electronics, but the mention of floating, swimming, etc. in the description may be misconstrued, so read carefully before deciding if this item will serve your needs. We have tested it in rainy and splashy conditions and can confirm that the contents remained perfectly dry and undamaged by humidity. 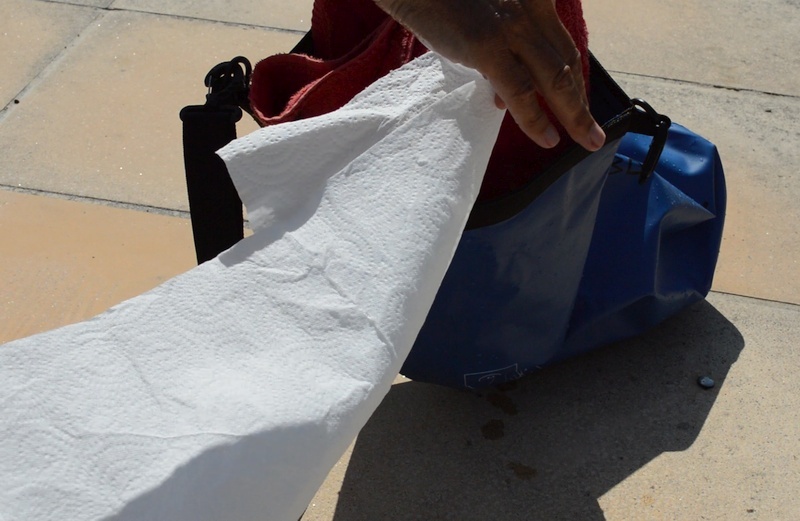 To put it to the extreme test, we also placed a towel and some paper napkins inside and immersed it repeatedly in the pool. Then we swam with it trailing behind us. 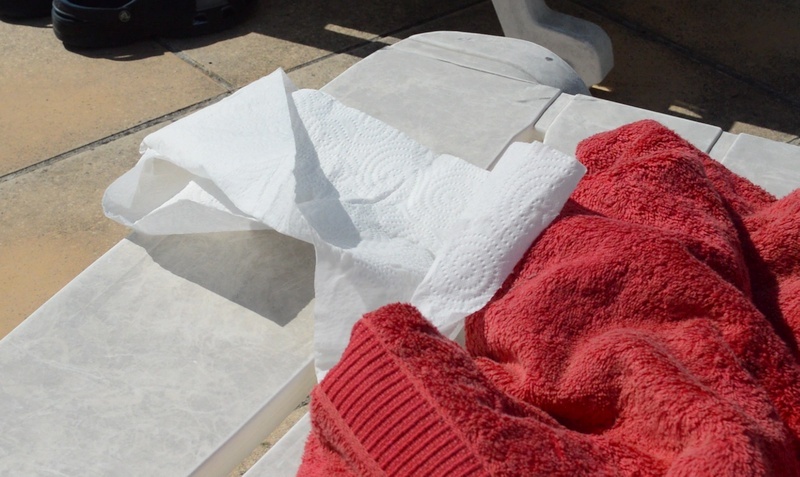 The towel and paper towels remained bone dry. You can see photos of these tests. The sack is made of tough materials that are easy to clean and promise a long useful life. One of the best looking sets of travel cubes I have had the pleasure to review. This kit consists of four cubes, in two very practical sizes. Currently, they are available in five colours, from conservative black to bright and cheery shades. I chose the gold colour and, in person, it is a little warmer than in the picture, a gorgeous, shimmery mustard or goldenrod; an original shade and a great complement to my brown-toned luggage. The strong, rip-stop polyester fabric feels quite substantial and is embellished with a complex diamond pattern. A very large mesh window on the top side allows a clear view of the contents. The two larger cubes are ideal for shirts, sweaters, skirts, or trousers, while the two smaller ones are well suited for swimsuits, underwear, socks, T-shirts, toiletries (preferably inside a moisture-proof bag) and even shoes. I really like the idea of organizing my suitcases, especially if two people are sharing the same case, or to separate daytime and night-time outfits. I was impressed by the quality of manufacture and finishing. With synthetic fabrics, loose threads are often apparent, but these organizers are really well made. All the internal seams are encased in sturdy grosgrain ribbon, and the stitching (often double) is executed with thread identical in colour to the fabric, so that it is invisible from the outside. Another sign of quality is apparent in the sturdy two-way zip fasteners which run smoothly, whether the bag is full or empty. The plastic toggles and nylon cords are a nice touch, easy to grasp and very visible. The mesh is quite open but does not look fragile. Each piece has a carrying handle made of grosgrain, which looks a bit delicate and the attachment point is perhaps the only weak link in the design; but then these cubes are not really meant to be carried over great distances. Apart from the obvious convenience of grouping several items together, these organizers are time savers because they can be quickly slipped in a hotel drawer or closet for later unpacking. As a little extra, the four cubes come in a transparent, resealable pouch, ideal to store them when not in use. Personally, when not travelling, I like to use these cubes to stack my out-of-season clothes inside closets and clear plastic storage boxes. 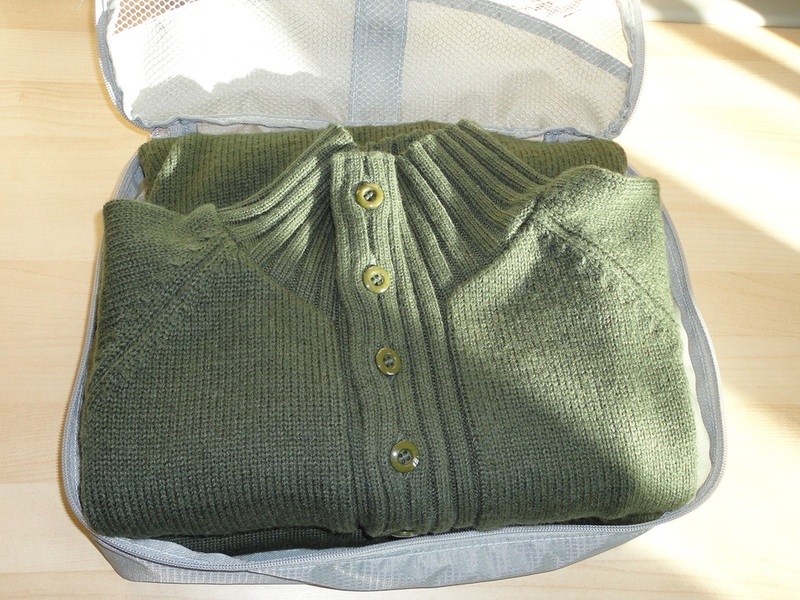 They hold folded clothes perfectly and, because of their compressing ability, jerseys and knit tops, especially, seem to take up a fraction of the space, and stay neatly folded and still easily available. The mesh front lets air circulate, and I can see the contents without having to open them. I am delighted with these beautiful organizers and, given their obvious quality, expect them to be durable as well. With careful hand-washing, they should remain pristine-looking for a very long time. A sample product was supplied to me for my evaluation and review, but at the current price, I would have been happy to buy them. Luggage organizers or packing “cubes” are suddenly a trendy, must-have accessory. Out of all the myriad varieties available, this beautiful set is one of the best. 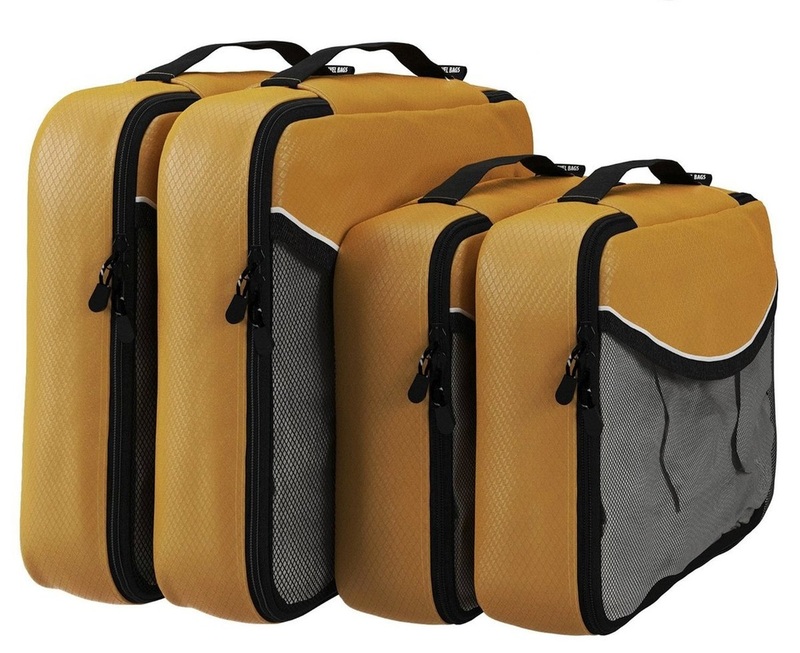 Each of the four bags has a different shape and size but they all have a polyester fabric back and sides, and a large mesh window on the front, showing the contents. I really like the narrow one with a built-in, stiff divider to separate shoes. 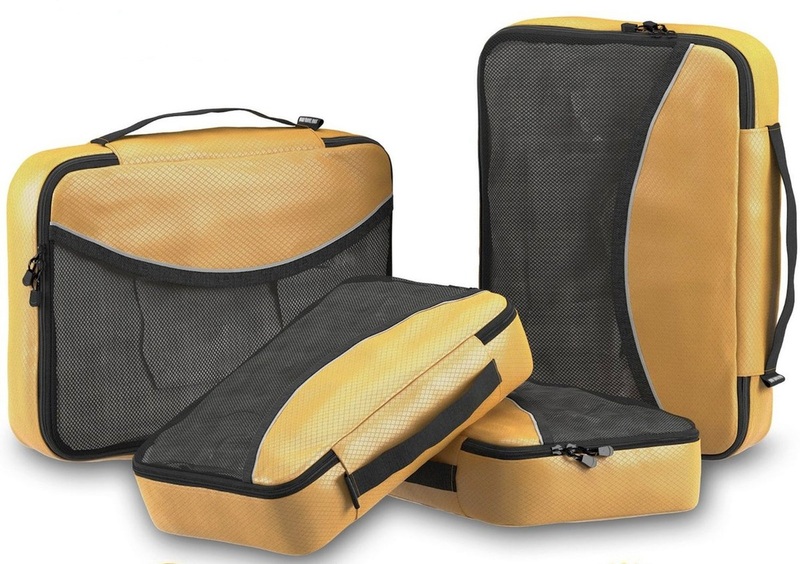 These organizers are very well put together, the stitching is regular, finishing is excellent and the two-way zips are of good quality and run smoothly, whether the bag is full or empty. The plastic toggles and nylon cords are a nice touch, easy to grasp and very visible. 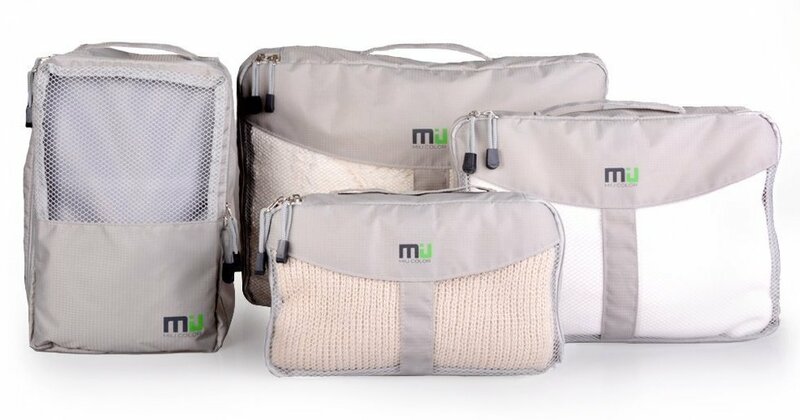 In person, the sleek polyester material is feather-light and very smart, a beautiful silver grey, and the Miu Color logo is actually quite stylish. They look really impressive, coming out of your suitcase! Although the mesh is delicate, it looks like these bags will wash well and remain pristine-looking without too much effort. Each piece has a reinforced fabric handle. In a pinch, they could be used as hand-luggage but might get damaged with that sort of handling. In my opinion, they are best used to organize the contents of your suitcase when travelling. They hold folded clothes perfectly and can go straight into a hotel drawer for later unpacking. In my large suitcase, they separate my tops and underwear from heavier skirts and trousers and, now that I have discovered them, they have become indispensable! But there is another ideal use for them. Since I don't travel much at the moment, I use these organizers to store out-of-season clothes in my closets, or inside clear plastic storage boxes. They effectively compress knit tops, for example, so they take up a fraction of the space, and allow me to stack things and still have them handy. 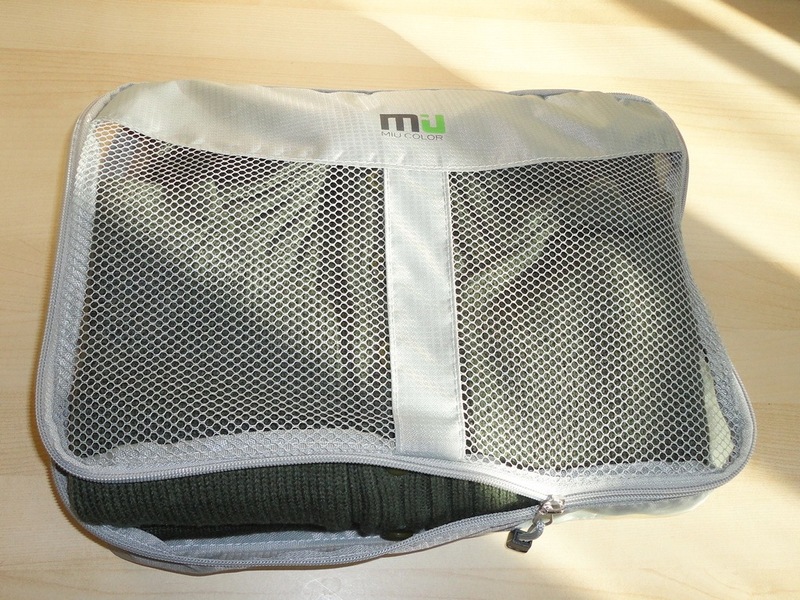 The mesh front allows air circulation, and I can see the contents without having to open them. I was offered a sample set to review, and I am simply delighted with the quality and versatility of these organizers. Time will tell with regard to durability, but they certainly look sturdy and well made and, with a modicum of care, should give years of service.